The garden was originally created in 1913 for the World Fair, when it was exhibited in the category of artistic gardening. Over the years it fell into disrepair but with funding from the Japanese embassy in Warsaw, it was finally revived in 1999. It features a tea pavilion, narrow bridges with cascading waterfalls, koi carp pond and oriental landscaping of shrubs and plants, There is a nominal admission charge of 4zl. (79p) to look around. Located a short walk to the south, we came to the Centennial Hall which was also opened in 1913. 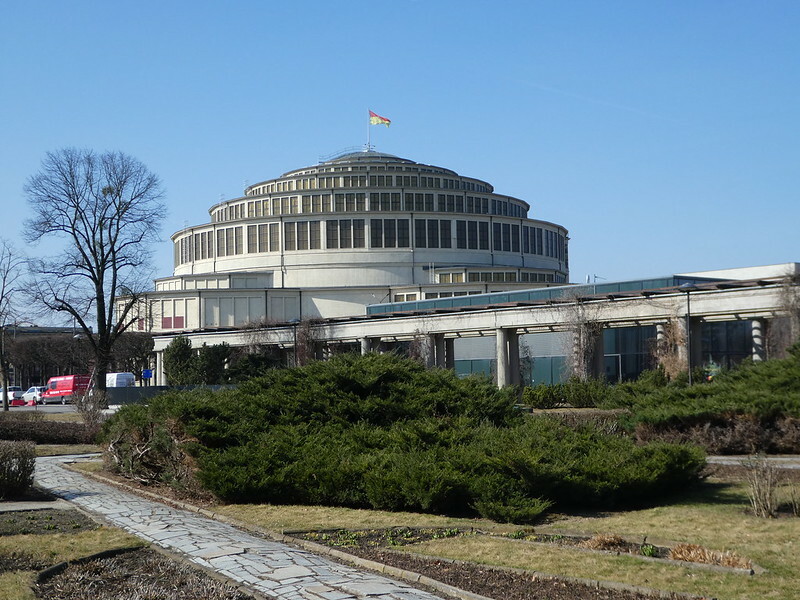 The building has become one of Poland’s national historic monuments and was listed as an UNESCO World Heritage Site in 2006 for its reinforced concrete architecture. It is nw mainly used for sporting events, concerts and exhibitions. To the left of the Centennial Hall stands a large pergola and semi-circular colonnade. It would be nice to return here one evening during the summer months when the multi-media fountain is operating. Built in 2009 in honour of the first free elections in post-war Poland, it is the largest fountain in the country and one of the biggest in Europe. With its dazzling displays of light, sound and water featuring 800 lights, 300 water jets and 3 fire jets, I’m certain it attracts many visitors and is a pleasure to see. 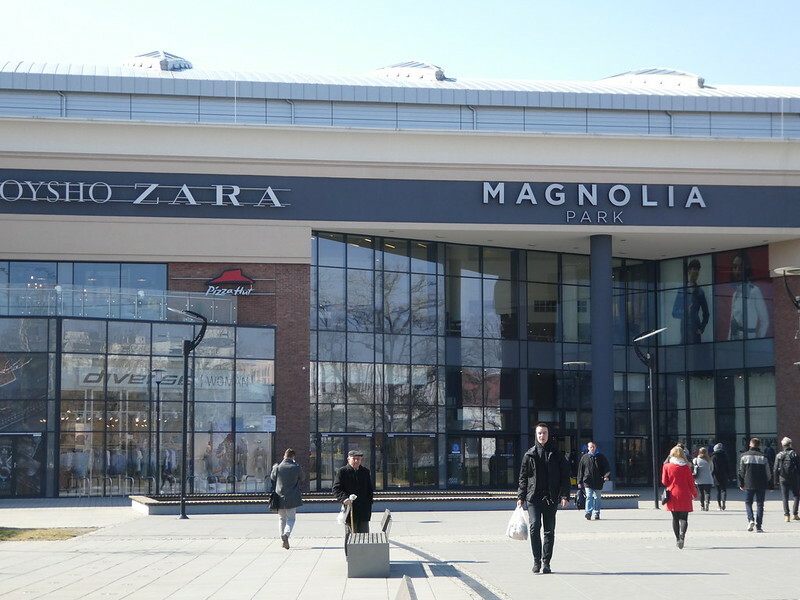 Leaving the park, we then felt the need for a little retail therapy, so we hopped on a tram to Magnolia Park, the largest shopping mall in Wroclaw. We were fortunate to have timed our visit to Poland to find shops open on a Sunday. Since March 2018, a Sunday trading ban has been enforced in Poland closing shops on alternate Sundays so it is a good idea to check the calendar before embarking on a Sunday shopping trip! It was then time for something to eat so we made our way back to the centre by tram and opted to eat lunch in Pierogarnie where we had enjoyed bowls of soup the previous day. 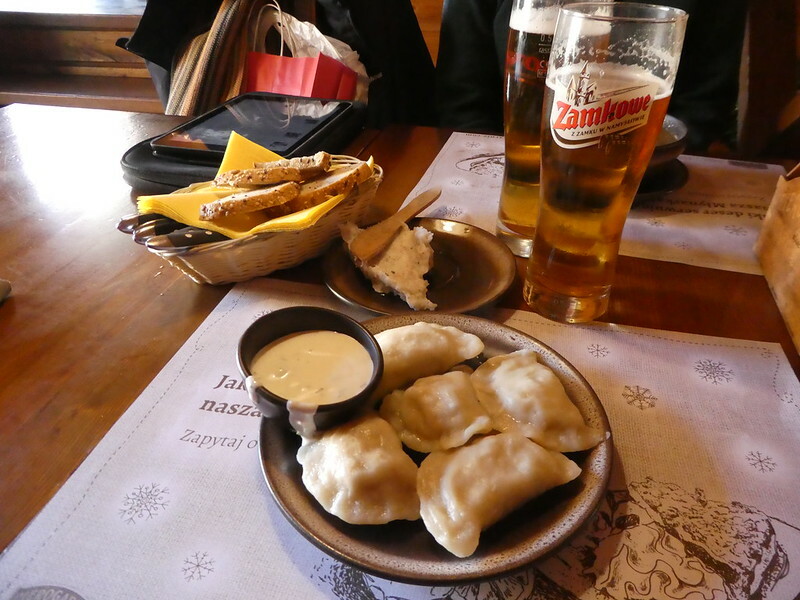 I didn’t want to return home without sampling local dumplings so I ordered some with a ham, cheese and potato filling which tasted delicious accompanied by a glass of beer. Returning to the hotel, there was just one more thing we wanted to see. 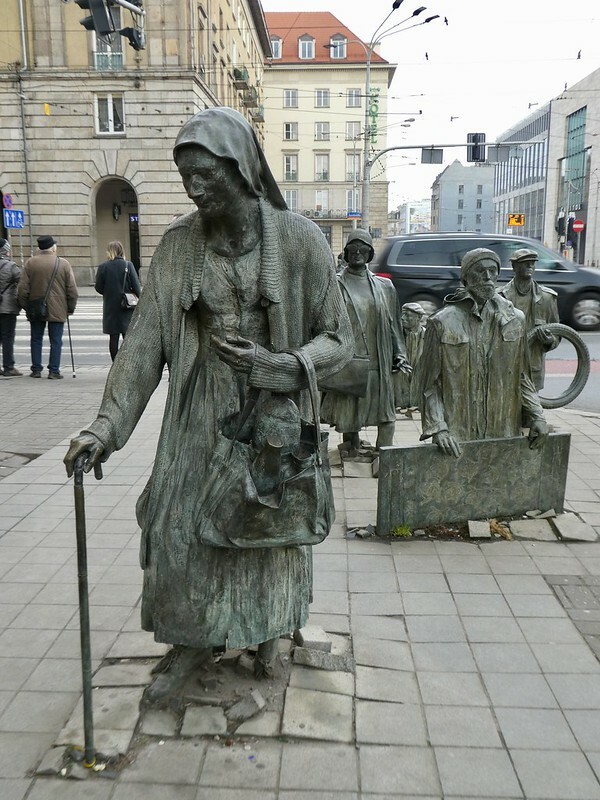 On the junction of Piludski and Swidnicka streets stands the Monument of the Anonymous Passerby. 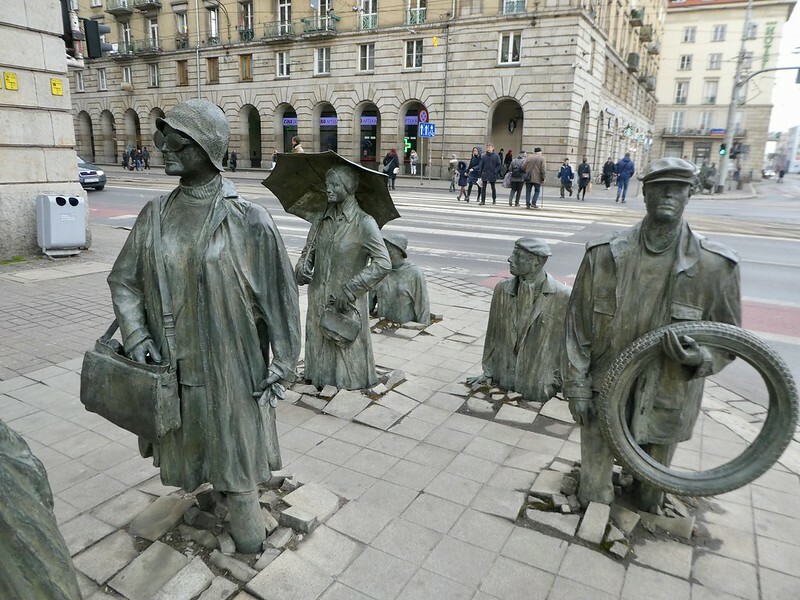 These bronze statues were originally displayed in Warsaw but moved to Wroclaw in 2005. The installation consists of 14 life like figures. The main character is a woman and the others are of her family, half of whom are falling into the ground in front of her whilst the other half are climbing up behind her. I’m pleased we found time to take a look at this unusual sculpture by Kalina, which is located on a busy street corner in the city centre. After collecting our luggage from the hotel, we caught the Airport Bus (106) from its terminus near Wroclaw railway station utilising our 24 hour ticket we had purchased the previous day. The journey back to the airport was quick and easy taking about 40 minutes and it was not long until we were sitting in one of the airside cafes enjoying a pot of tea. Our return flight with Ryanair to Leeds-Bradford airport departed on time and in a little over two hours we were back in the U.K. after an enjoyable weekend in yet another of Poland’s beautiful cities. 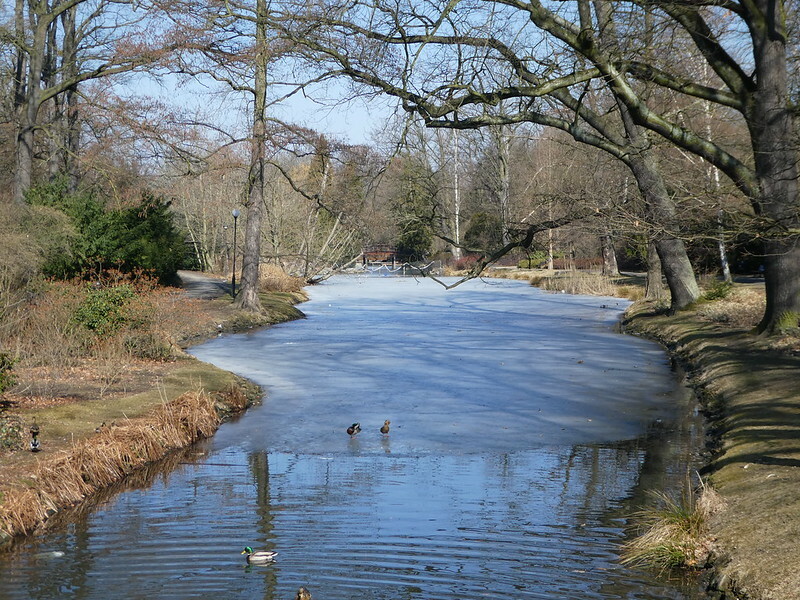 So nice to read that you are enjoying the Easter sunshine in Wroclaw. I’m back home now otherwise it would have been lovely to catch up with a coffee. Maybe some other time! Enjoy your stay in beautiful Wroclaw. Wrocław sounds cool. I’ve never heard of the place before. Thanks for bringing an interesting Polish town to light. Wroclaw is a beautiful city that deserves more recognition as it’s just as nice as Krakow. Am loving those statues Marion; no wonder you were glad you got to see them. Thanks Sue, the statues of the Anonymous passerby were brilliant. Hope you’re having a great Easter Break in Cambodia! Hi M. It’s a nice time here thank you albeit it’s incredibly hot and humid. A brilliant reportage and great photos! Thank you for your kind words. It’s so nice to learn that you found this post on Wroclaw interesting. Wroclaw looks like such a wonderful place to visit! The colourful buildings make the place so colourful. I particularly love Polish Dumplings they’re delicious! Thank you Adell for your kind words. It’s good to read that you also enjoy Polish dumplings. Those statues were amazing appearing to rise up and fall down into the pavement. Thank you for your kind words, it’s good o hear from you. Really enjoyed reading your posts about your weekend escape to Wroclaw as my husband and I only made time for the other cities you’ve also visited in Poland when we there several years ago. I loved touring Poland for a couple of weeks as the Polski buses were a very cheap way of getting from Point A to Point B and almost luxurious with attendants on board and free snacks, too, as I recall. You’ve made me want to return to Poland and take time to also see Wroclaw. Happy travels in the future. Thank you Annie for your lovely message. It must have been a splendid experience touring around Poland for two weeks. I can definitely recommend visiting Wroclaw if you are ever in Poland again. Reading of your interesting journeys though some of Poland, makes me regret I didn’t get to see at least some of it! Happy travelling…. Thank you Joy for your kind words. It’s a pity you didn’t have an opportunity to see these places yourself but hopefully you can enjoy reading about them from the comfort of your armchair! beautiful place…how was the weather? Thank you for your kind words. It was quite chilly but with lots of sunshine so we kept nice and snug wearing padded coats and scarves. Thank you for your kind words Misha. I’m glad you enjoyed this post. Thanks Suvi. Have a lovely weekend away. I love blogs which are set out like this, with a great clear itinerary – a godsend for over-planners like myself! 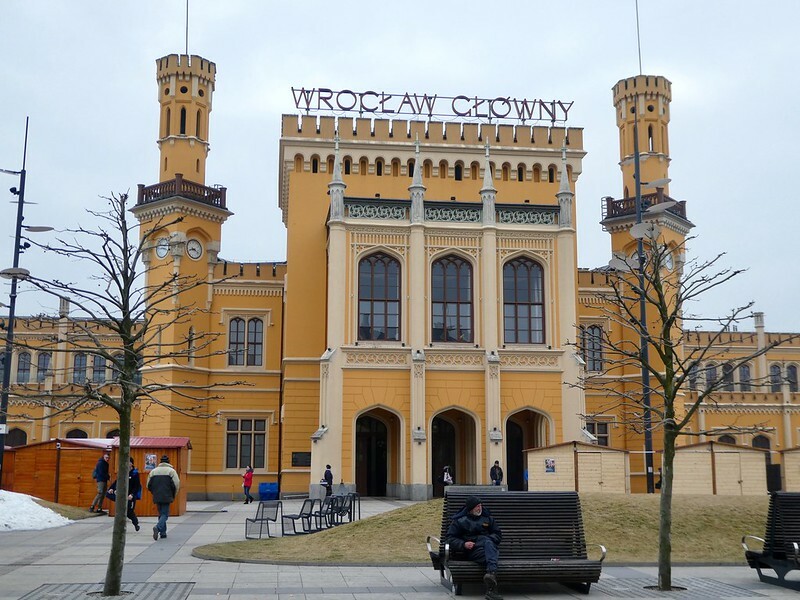 Wroclaw is definitely on my list – we only made a very brief visit there after being stranded at the airport due to fog in Krakow! 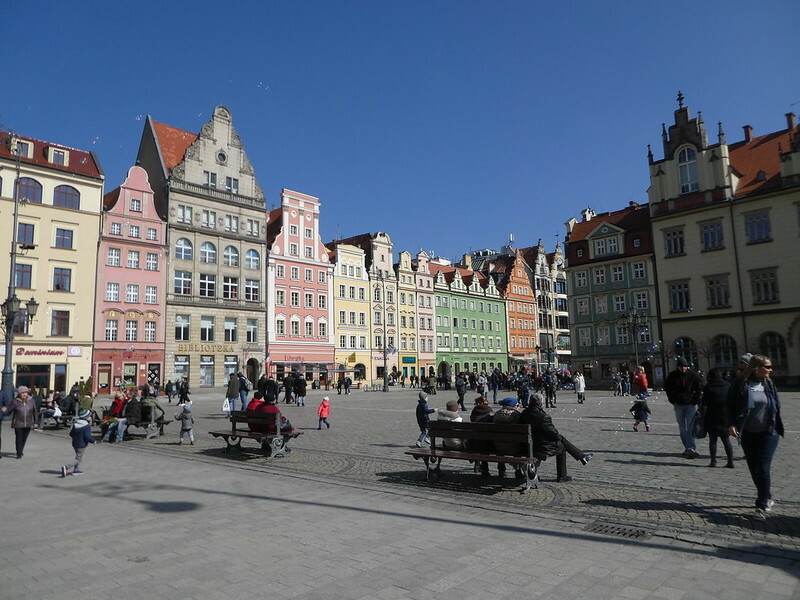 How does Wroclaw compare to Gdańsk for a weekend city break? Thank you for taking an interest in my blog Emmalene, it’s so nice to hear from you. Wroclaw is a gorgeous compact city to visit. 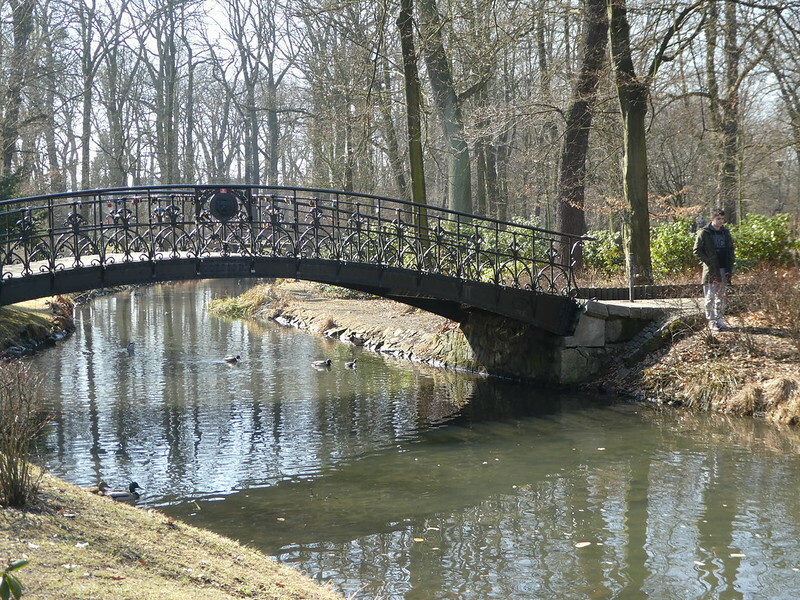 It’s quite different from Gdansk as that’s beautiful too but it also has such interesting places nearby such as Sopot. Great posts on this part of the world. Thanks for sharing. I have nominated you for the Versatile Blogger Award. You can find my post here. Thank you for your kind words and for the nomination, it’s much appreciated. I’m fascinated by the statues of the anonymous passerby…! Do you know more about them? The statues are fascinating but unfortunately I don’t know more about them as they are only mentioned in Polish on the official website. Wroclaw looks interesting especially the Old Town and that food looks delicious. One of those places that I really don;t know much about. Nice photos. Thanks for your welcome thoughts Jonno. Wroclaw is lovely for a short break with its beautiful architecture and delicious dumplings. I hope you manage to fit in a visit sometime.